[Update 5:32 a.m.] With the worst seemingly behind them, Hawaiians breathed a sigh of relief. [Update 5:25 a.m.] Most places in Hawaii are on the fourth tsunami wave, Pacific Tsunami Warning Center's Gerard Fryer told reporters, noting that the data now shows the evacuation may not have been necessary - but was still a good precaution. [Update 5:18 a.m.] The third wave from the tsunami is coming ashore. The highest so far has been 1.9 feet (23 inches) at one Hawaii island, but generally, the wave heights have been lower than anticipated. "We're not out of it yet," said John Cummings, spokesman for Honolulu Emergency Management. "We're still anticipating a destructive event." - "The tsunami is arriving right now. I can't say how big it is because it's coming in as we speak." - "Typically the first wave is not the largest. Having inconvenienced everybody by making them evacuate in the middle of the night, I was hoping it would be bigger. The following waves I am sure will be bigger." [Update 4:35 a.m.] Hawaii News Now is showing live pictures of the coastline. Nothing seems out of the ordinary. Did Hawaii dodge a bullet? Or is it still too soon to tell? [Update 4:28 a.m.] As the clock ticks closer, the sense of urgency is palpable, says CNN's Augie Martin, who is on a hotel rooftop in Big Island. Planes are flying overhead, illuminating their spotlight on the coast as they fly. [Update 4:14 a.m.] Peter Carlisle, the mayor of Honolulu, issued an urgent and dire last-minute warning: If you haven't evacuated yet, don't count on the police to come and help you. Because with the tsunami expected to hit just minutes from now, officers in low-lying areas have also been told to seek safety. Meanwhile, Shelly Kunishige of the Hawaii State Civil Defense said she hopes the word has gotten out and people have heeded. "People are evacuating, the roads are somewhat congested. We didn't have had as much lead time as we have had with previous tsunami warnings and this is under the cover of night and this has slowed down the process somewhat," she told CNN. [Update 4:10 a.m.] The tsunami advisory has been canceled for southeast Alaska. But it continues for British Columbia, southern Oregon and northern California. [Update 3:49 a.m.] Neil Abercrombie, the governor of Hawaii, has just signed an emergency proclamation. Such a proclamation hands the governor emergency powers to deal with natural and man-made disasters or emergencies. [Update 3:44 a.m.] The Honolulu neighborhood of Waikiki was hosting a blocks-long Halloween party, Hallowbaloo, where 15,000 people were expected. Frank Bridgewater, editor of the Honolulu Star-Advertiser, told CNN he wondered how that many people were pulling out ahead of the tsunami's arrival. [Update 3:23 a.m.] "There's no reason to panic but there's every reason to take necessary precautions," said Honolulu Mayor Peter Carlisle. He asked residents not to clog traffic, but it may be too late. Local television are showing images of bumper-to-bumper traffic on roads leading from the coast to inner ground. [Update 3:18 a.m.] About 80,000 people live in evacuations zones in the island of Oahu, which is home to Honolulu. John Cummings, spokesman for the Honolulu Emergency Management, said officials have opened 26 centers for evacuees. [Update 2:31 a.m.] There have been about 9 aftershocks, most of them greatly lower than the initial quake in magnitude. [Update 2:16 a.m.] CNN's Augie Martin who is in Big Island just sent this e-mail: "We are currently in Hawaii and tsunami sirens are now blaring, FYI." [Update 2:09 a.m.] Hawaii can expect waves between 3 and 7 feet, said Gerard Fryer, senior geophysicist at the Pacific Tsunami Warning Center. "We are recommending coastal evacuation," he said. [Update 2:02 a.m.] The National Weather Service now says that a tsunami ADVISORY has been expanded to include northern California and southern Oregon. Bear in mind, this is an advisory, NOT a warning. An advisory means a tsunami capable of producing strong currents or waves dangerous to people near the water is expected. 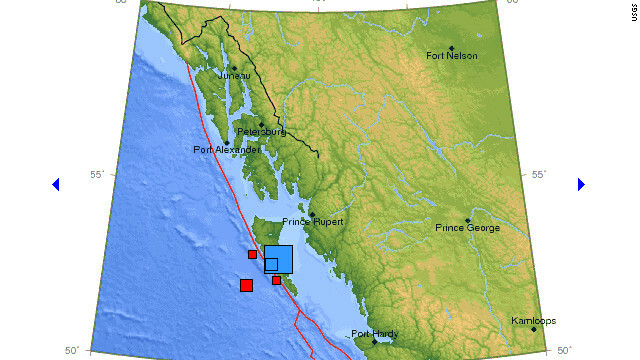 [Update 1:45 a.m.] Here's a recap: A large quake has hit off the coast of Canada. We have just received news that a tsunami warning has been issued as far as Hawaii. If you know you're in an evacuation zone in Hawaii, you need to pack up and move out. In a little less than three hours, about 10:38 Hawaii time, the first waves will hit Hawaii. What areas of Hawaii? The towns of Kahului and Hilo are likely to see a succession of waves. The shorelines will be dangerous for a couple of hours. "Basically this tsunami is pointed right at us," said Gerard Fryer, senior geophysicist at the Pacific Tsunami Warning Center. [Update 1:32 a.m.] The #PrayforCanada hashtag has become a worldwide trending topic on Twitter. [Update 1:25 a.m.] A tsunami warning has now been issued for the state of Hawaii, the Pacific Tsunami Warning Center said. [Update 1:05 a.m.] Julianne McCaffrey of British Columbia Emergency Management is on CNN International right now. She says officials are watching the coastal areas and ensuring people are complying with the directives of local authorities. "We've not received any reports at this time of any damage." [Update 12:44 a.m.] Fryer also clarified exactly what area the tsunami warning encompasses: It is for coast of British Columbia, from Vancouver to the southern panhandle of Alaska. Hawaii is NOT under warning. [Update 12:38 a.m.] Gerard Fryer, senior geophysicist at the Pacific Tsunami Warning Center was just on CNN International and put the magnitude of the quake into perspective - while at the same allaying much of the concern. "A 7.7 is a big, hefty earthquake. It’s not something you can ignore," he said. But, he added, "this earthquake was partly under the island and mostly under shallow water." "I think we have to be thankful it happened where it did . .. if that were a heavily populated area, it would have caused significant damage," he said. "It definitely would have done significant damage if it had been under a city." [Update 12:31 a.m.] A small tsunami has been recorded on a deep ocean pressure sensor, the Pacific Tsunami Warning Center said. The warning region remains the same. [Update 12:23 a.m.] Julianne McCaffrey with Emergency Management BC tells CNN there are no reports of damage at this time. [Update 12:12 a.m.] The USGS is now reporting a second aftershock: Magnitude 4.8 about 126 miles south of Masset. [Update 12:02 a.m.] Some coastal areas in Hawaii may feel small non-destructive sea level changes and strong currents for the next several hours, said the Pacific Tsunami Warning Center said. [Update 12 a.m.] A 5.8-magnitude aftershock was felt 96 miles south of Masset, Canada, according to the USGS. He said he has not seen any major damage in his town; just a broken window. The shaking lasted for a while, he said. [Update 11:52 p.m.] Fritz Engelhard, who lives in Masset, British Columbia, said he felt the tremor even though his town is 86 miles from the epicenter. Residents have been asked to seek higher ground because of the tsunami warning, he said. [Update 11:47 p.m.] The tweets started populating the Twitter timeline as soon as residents felt the tremor. [Update 11:46 p.m.] The tsunami warning is in effect for the coastal areas of British Columbia and Alaska - from the north tip of Vancouver Island, British Columbia, to Cape Decision, Alaska. Such a warning means that all residents in those coastal regions should move immediately inland to higher ground. [Update 11:43 p.m.] The Alaska Tsunami Warning Center has issued a tsunami warning. [Posted at 11:40 p.m.] A 7.7-magnitude quake struck off the coast of Queen Charlotte Islands in Canada late Saturday, the U.S. Geological Survey said. The quake had a depth of 10.9 miles.